If you want to keep your top performers motivated to obtain meaningful achievements for your organization, recognition is key. Less than one-third of American workers are engaged at work, reports performance management consulting company Gallup, and the firm states that one of the most meaningful ways to recruit and keep top talent is by showing work is valued through recognition. Employee awards, given for outstanding performance and to celebrate milestones, should be an essential part of your business strategy. From an employee of the month award, to awards given at an annual party to recognize unique accomplishments, there are plenty of ways to incorporate employee awards into a business schedule. Whether your business is new and growing, or your employee award ideas could use a refresh, here are employee recognition ideas that will thrill employees and impress those beyond your company, as well. Make meetings something to look forward to by including a recognition aspect. For frequent meetings, giving inexpensive tokens of appreciation like a branded mug or coaster is an easy way to express thanks for a job well done. For less frequent meetings that involve more people, like a monthly company-wide meeting, you could choose a few bigger awards to hand out to significant contributors or give a more substantial employee of the month award. When your staff knows that meetings they go to will include a fun, bonding experience like the handing out of an award, they’ll bring a positive attitude to meetings and will work harder in the meantime in hopes of being recognized. Even small gestures can make a big impact in maintaining motivation. Retaining loyal employees is extremely valuable to your business, because replacing salaried employees can cost nearly 10 months’ worth of salary per employee. One way to give employees who have worked with you awhile something to look forward to the longer they stay is to hand out employee awards based on milestones of work tenure. You could give out desk accessories like personalized paperweights, business card holders, or letter openers to team members as gifts on their work anniversaries. 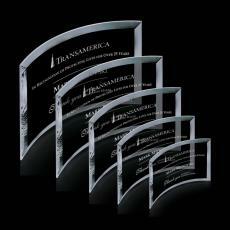 These types of stylish employee awards are functional and long-lasting, and may be proudly displayed in an office for clients to see. Co-workers who see employee recognition ideas like these that are given out may be more inclined to stay at your company, because they demonstrate that you value dedication. When employees go above and beyond what their job description entails to produce exceptional work for your business, showing gratitude with an award helps to reinforce your investment in your employees and what they produce for you. You could make an award even more special by choosing a functional item the recipient will appreciate, like a candle holder or wine in a personalized wine box. One-off awards that aren’t expected are pleasant surprises. Psychological conditioning studies show variable ratio reinforcement, which means behavior that is reinforced positively after an unpredictable number of times, is highly effective because all employees will continue to perform because they might be rewarded at any time. This type of employee recognition can produce significant rewards for your business. Hosting a social event outside the office is definitely a time to unwind, but integrating a positive segment of the party like employee awards is something your staff and their guests will appreciate. All-staff parties are great ways to execute employee recognition in front of more of your team, so that employees can learn about how co-workers they might not work with on a daily basis contribute to the company. Including employee award ideas for work parties is also wise because anyone who doesn’t work for your company, but who is in attendance, will see that your business values its staff. Whether you have invited clients to the party or allow your employees to bring spouses or partners, employee recognition will show outsiders that your business is a great one to work for. This might help increase referrals for your company or at least improve public relations for your business. From boosting the morale of your team, to keeping top performers at your company, to increasing productivity of staff, to gaining a great reputation, giving employee awards provides so many benefits for within and outside of your business. Use your annual work calendar as a place to start identifying times when employee recognition through corporate awards, glass trophies, personalized plaques, and more should be included. Don’t forget to keep some employee awards on hand for spur-of-the-moment recognition, as well. 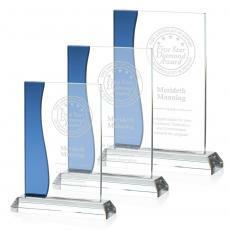 When you shop for employee awards from Awards.com, you save money with free shipping and free engraving and logo. 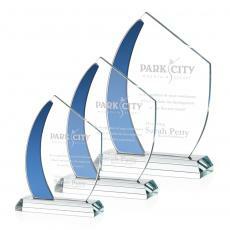 Make your awards as personal as you’d like, and shop employee awards to fit any budget or occasion. Browse hundreds of employee recognition ideas here now.